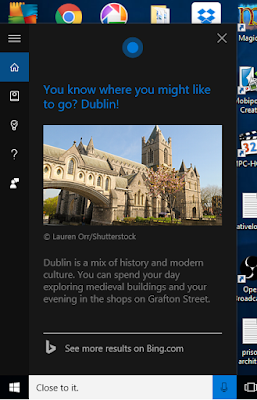 I was playing with Cortana tonight, when it tagged onto the end of one of its answers "Why not ask me where to go on holiday"
So I did. We went through various questions - did I want a city break, should it be lively or chilled out, a long distance or close to home, and so on - and I got the below. Yep Dublin - which is impressive because I love Dublin (especially the Guinness! ), and am planning to go later in the year with my dad (once he's survived the interrogation of the UK Passport Service - only kidding, I'm sure it'll be fine! ), so full marks to Cortana on this one! Nice one I actually like Cortana. Me too, the speech recognition is really good.